Obituary for Harold Edward Tucker | George C. Lima Funeral Home, Inc.
Harold Edward Tucker, 91 of Noyes Avenue, passed away on March 31, 2018 after a brief illness. Born in Bristol, the son of the late William Atwell Tucker and Jennie (Rapperger) Tucker. He leaves behind his beloved companion, Hilda LaChance of Swansea, MA; his son, Brian Tucker of Bristol and his daughter, Debra Ray of Orlando, Florida. He was the proud grandfather of Ellen Toner (Frank Toner), Jennifer Kneeland (Mark Kneeland), Christa Skipworth (Andrew Skipworth), Jeremy Ray (Jenny Ray) and Marc Ray (Hilary Ray) and the adoring great grandfather of Matthew Toner, Aidan Toner, Maryssa Vaillancourt, Olivia Kneeland, Nathan Skipworth, Ethan Skipworth, Sofia Skipworth, Grace Ray and Lucas Ray. He was the little brother of his 99 year old older brother William A. Tucker and the late Arthur Tucker. Mr. Tucker was a graduate of Colt Memorial High School, Class of 1945 and studied Architectural Construction at RISD. He served in the Army Air Corps as a Private First Class at Williams Field in Arizona during World War II, earning the World War II Victory Medal, the Good Conduct Metal and the American Theater Ribbon. In his early days he worked for Kaiser Aluminum and Raytheon. 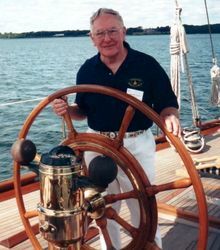 His idea of retiring was working a self-employed handyman and volunteering at the Herreshoff Museum well into his 80's. He was an Eagle Scout and went on to become the Scoutmaster of Boy Scout Troop 2 for over 40 years. Mr. Tucker served as the Director of Emergency Management and as Chairman of the Bristol Republican Town Committee. He was the former Chairman of the Red Feather and Red Cross Fundraising Campaigns. He joined the Bristol Yacht Club as a teenager in 1942. He sailed his cherished Sea Sprite, Amon, with his friends, children and grandchildren as much as he could racing every Wednesday night until he was 88. He served as a member of the US Olympic Sailing Committee in 1980. He loved traveling, bowling, ball room dancing and his New England Patriots. Friends of the Bristol Animal Shelter, 11 Broad Common Road Unit 155, Bristol RI 02809 . Arrangements are with the George C. Lima Funeral Home.